The DOCTYPE tells the browser which type of XHTML standards you’re using. The Twenty Fourteen theme uses <!DOCTYPE html>, which is a declaration for W3C standards compliance mode and covers all major browser systems. The <html> tag tells the browser which language you’re using to write your web pages. The <head> tag tells the browser that the information contained within the tag shouldn’t be displayed on the site; rather, that information is about the document. On the Edit Themes page, click the Header template link to display the template code in the text box. Look closely and you see that the <!DOCTYPE html> declaration, <html> tag, and <head> tag show up in the template. The <head> tag needs to be closed at the end of the Header template, and the closing tag looks like this: </head>. You also need to include a fourth tag, the <body> tag, which tells the browser where the information you want to display begins. Both the <body> and <html> tags need to be closed at the end of the template, like this: </body></html>. The Header template makes much use of one WordPress template tag in particular: bloginfo();. Here’s a useful tip about your blog’s <title> tag: Search engines pick up the words used in the <title> tag as keywords to categorize your site in their search engine directories. The <title></title> tags are HTML tags that tell the browser to display the title of your website in the title bar of a visitor’s browser. $sep: Or separator; this is the text that gets displayed before or after the post title. In the case of Twenty Fourteen, the $sep is defined as ‘|’. $display: This accepts only two arguments: true or false. 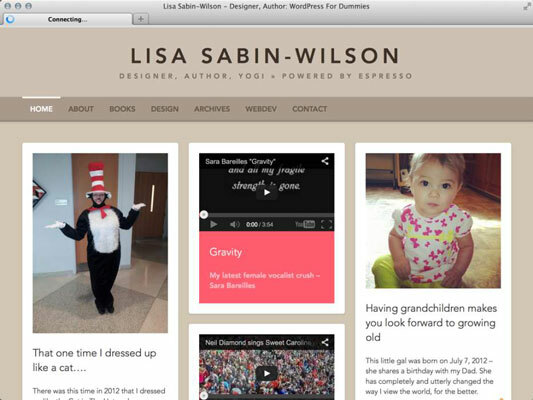 Set to true, as in the Twenty Fourteen theme, tells WordPress to display the actual title of the page. Set to false tells WordPress to return the title to be used within a PHP function. In Twenty Fourteen, the value is set to true. $seplocation: This tells WordPress exactly where to place the separator text in relation to the title of the post. The separator is always placed in front (or to the left) of the post title, unless you set the value to right, as in the Twenty Fourteen theme. Set to right, the location of the separator is after the post title. Most WordPress themes show your site name and tagline in the header of the site. This tag pulls the tagline directly from the one that you’ve set up on the General Settings page on your WordPress Dashboard.